Have you tried Tunisian crochet before? Are you interested in trying a totally unique needle craft that will compliment your crochet projects? 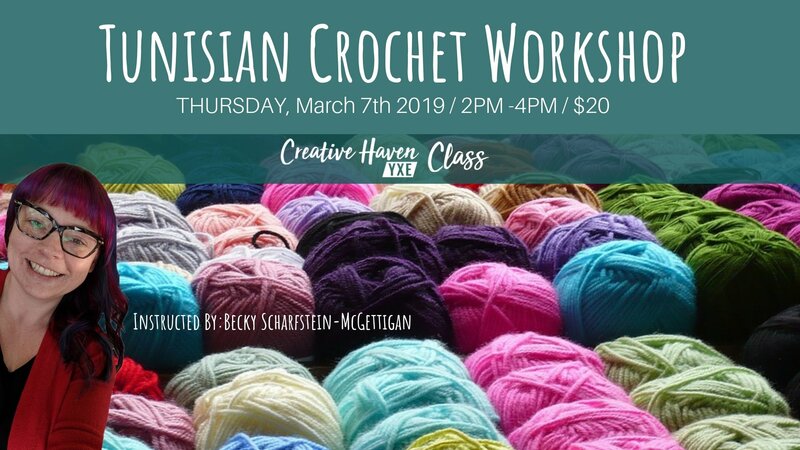 Creative Haven YXE has a workshop for you. In this workshop you will learn some basic Tunisian Crochet stitches and how to read a Tunisian pattern. Please contact Becky at 306-880-4888 if you would like to know if this workshop is for you. Fortunately, if you’re already a crocheter or knitter, learning the Tunisian crochet technique is a breeze. The end of the Tunisian hook looks just like a crochet hook, and you’ll find that some knitting skills will translate right over to Tunisian crochet.